Are you in need of more finished living space and are struggling between building a home addition versus buying a larger home? Well more often than not building a house addition is the more economical way to go. In addition, house additions offer much more flexibility than one may initially think, both in function and design. For example there are several types of home additions to consider. In terms of building costs, depending upon the type of house addition you choose, you can expect to pay anywhere from the low 5 figures, to a price tag more expensive than the original cost of the main home. This type of home addition consists of one or more rooms that are appended onto one or more sides of the existing house. A room addition could be as simple as adding on an additional bedroom. However, often a room addition consists of more than one room, e.g. a master bedroom with a master suite bathroom, or a family room and expanded kitchen. Building a home addition is a major construction project, as it’s akin to building a home. Building a home addition involves constructing a building structure from the ground up and tying it into the existing home. Often an architect and general contractor are required to design and manage the construction of the project. Expect to pay anywhere from $80 to $200 per square foot for this type of house addition. However, home additions often offer a high return on investment. The garage conversion is a type of home addition that involves converting an existing garage into a finished living space. Use one of these home remodeling checklists and save time and money on your home addition project. A garage conversion is less expensive to do than building on a room addition since the building structure and roof are already in place. In addition, electrical work is already roughed in, albeit you may need to add more outlets and switches. Also, in some finished garages the walls are already insulated and drywalled. Get this garage conversion checklist to save time and money on your garage conversion project. The only real negative about this type of home addition is that it’s tough to make it aesthetically appealing on the exterior. A secondary concern is the fact that you lose a garage when converting your garage into finished living space. A home with an attached garage is much easier to sell than a home without. A bump out addition doesn’t really create a separate room. Instead it effectively allows you to expand an existing room. This type of home addition, for example, is ideal for increasing the size of a kitchen or bathroom. Bump out additions require additional roofing. Often bump out additions are supported on piers or posts, versus a complete foundation. In terms of cost per square foot, a bump out addition is fairly expensive. The main reason for this is you don’t get a lot of bang for your buck. Most bump out additions are fairly small, so the overall cost of the project divided by a small area equals a pretty high cost per square foot. If you can afford it, it’s better to spend your money on an entire new room addition than on a bump out addition. This type of home addition is a great way to create more living space on a limited budget. Further costs can be saved on this type of house addition if it is designed for only three season use. There are also a number of companies that make pre-manufactured sun room additions that are economical to install/attach to your home. In addition, pre-fab’d sun rooms have come a long way in their construction and window insulation R-values. A conservatory is a type of home addition that is meant more for plants and flora than for human beings. It contains a lot of glass and can be constructed as a three or four season room. Like sun rooms, there are a number of manufacturer’s of pre-fab’d conservatories. Typically conservatory additions are priced higher than sun room additions. So before choosing to sell your existing home and buying a larger one to gain more finished living space, fully explore the various types of home additions and cost out one to see how much you could save in the long run. You may be pleasantly surprised. 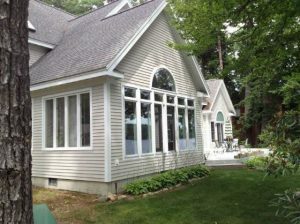 For more help on building a room addition, see HomeAdditionPlus.com’s Home Addition Bid Sheets. 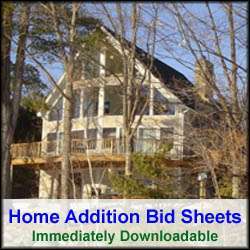 Our Home Addition Bid Sheets provide you with the knowledge and information on how to plan a home building project, and what to look for when hiring contractors. They also include detailed cost breakdown tables and spreadsheets for estimating your own new home construction building costs.